About 13% of boys with DMD have mutations in a region between exon 45 and 50, which bumps exon 51 “out of frame” and throws a wrench into the cellular machinery that reads the gene’s instructions, stopping production of dystrophin. In 2009, a team led by Richard Piercy at the Royal Veterinary College in London identified a spaniel with signs of DMD that had a spontaneous mutation deleting exon 50, which similarly moves exon 51 out of frame. 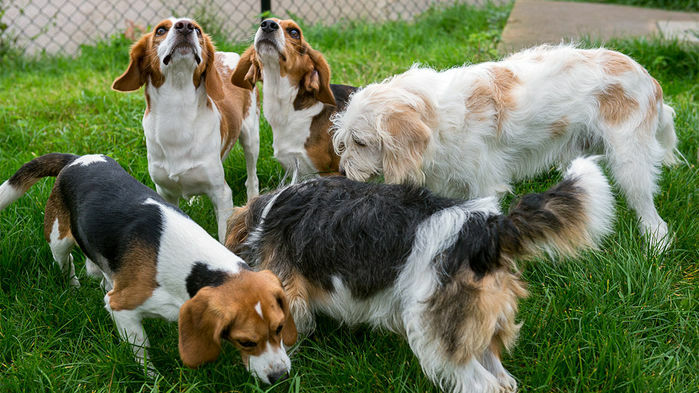 They later bred a relative of that dog with beagles, which have long been used in biomedical research, to create a colony with DMD symptoms. Another challenge was to alter billions of muscle cells throughout a living animal. So the team enlisted a helper: a harmless adeno-associated virus that preferentially infects skeletal muscle and heart tissue. Two 1-month-old dogs received intramuscular injections of the virus, engineered to carry CRISPR’s molecular components. Six weeks later, those muscles were making dystrophin again. Those results led the researchers to give an intravenous infusion to two more dogs, also 1 month old, to see whether the CRISPR-carrying viruses could add the genome editor to muscles throughout the body. By 8 weeks, Olson told the meeting, dystrophin levels climbed to relatively high levels in several muscles, reaching 58% of normal in the diaphragm and 92% in the heart. But because the dogs were euthanized, Olson could show little evidence that they had avoided DMD symptoms, save for a dramatic video of a treated dog walking and jumping normally. “There are a lot of questions that have to be addressed,” acknowledges Leonela Amoasii, who works in Olson’s lab at UT Southwestern and is director of gene editing at Exonics. Skeletal muscle is constantly being replaced, so the treatment would have to reach its stem cells to avoid the need for repeated injections. Longer studies will be needed to make sure that the CRISPR treatment does not introduce cancer-causing mutations. Even if it safely restores the ability to make dystrophin, the treatment likely will only help boys who receive it early in life because the muscle damage is irreversible. And ultimately the treatment would have to target many other DMD-related mutations to help most boys with the disease. “We have to make sure that we dot all the i’s and cross all the t’s because the implications for both DMD and CRISPR therapy are immense,” Olson says.